Volkswagen Golf 1.2 TSI with an automatic transmission. 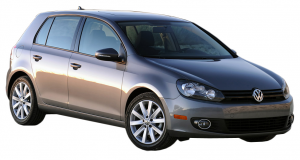 The German front wheel drive hatchback is a brilliant representative of the budget category of cars. It consumes only 5.7 l / 100 km, sufficiently practical, unpretentious. The vehicle has a good and reliable suspension and demonstrates control and predictability on the road. The main characteristics of this car inferior to the legendary Volkswagen Golf 7 1.2.